We met in July at the Brooklyn home of Jody and Jodi Ann Cameron. Several enjoyed their pool, all enjoyed the potluck supper. The Charter was draped in memory of 60 year Granger, Edwin Benjamin Sr.  We held our officers planning meeting and now have an official “Web Master”! Matt Maher accepted the position. He will also be handling FACEBOOK for the Grange. Thanks to Paulette Craig for stepping up to the plate as Fair Secretary this year. She has enthusiasm and energy; both fantastic! We have teams volunteering at Washington County Fair again this year and several signed up to work in the Pomona Booth at Brooklyn Fair. J. Allen Cameron and Shelley St. Jean have moved back to CT and J. Allen has accepted a position at a large dairy farm in Hebron. We wished our President Happy 21st Birthday at the meeting at  Cameron’s home--we all enjoyed her cake and she endured our singing! Katie is truly a faithful Granger to spend her 21st birthday running a Grange meeting! Congratulations to Pomona Scholarship winners:  Jaimie Cameron (continuing education) and Jacob Gervais (graduating Senior). We also voted to submit the name of J. Allen Cameron as Outstanding Young Farmer. Our Fair premium books are available. State Senator and Ekonk Granger, Mae Flexer, gave a legislative update and answered questions on the budget. 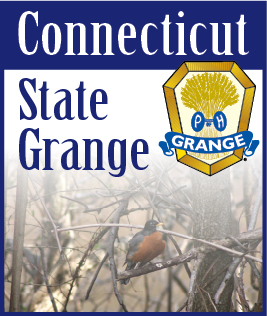 Aug. 3: Grange 7:30 p.m.
Aug. 8: 33rd Annual FAIR!